People who work in office departments have to sit in one place and do their work for 8 or 12 hours in a day. 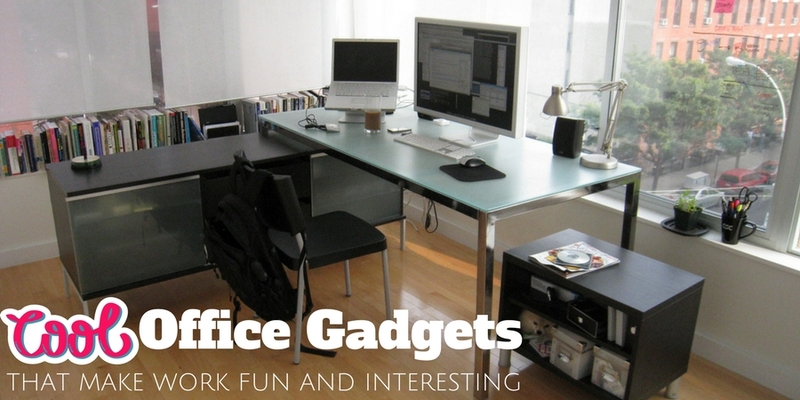 Eventually, work area becomes very boring and dull but if you use some cool stuff in your office then your work area might become more exciting. There are so many offices where stationary or interiors can be custom made which can make the office or the desk area more of an enjoyable experience. Many inventors have come with amazing and cool gadgets that can enhance your work life. A Cup holder can help you to not spill your coffee or tea on your desk area. Many have lost their important documents and files while drinking their refreshments but with a Cup holder you cannot afford to spill any drinks near your desk area anymore. It is very handy for people who can’t get off their desk to have a coffee or tea, thus cup holder is the best solution for them. If you are a very economic person and if you want to use economic methods to save on your energy and use Mother Nature instead then use Solar Energy USB Charger. The battery of the Solar Energy USB Charger gets charged from the solar energy and then you can use it to charge your Mobile phones, Tablets, and many more chargeable devices. If you can’t decide on something and if you want someone to decide something for you randomly then Decision spinner is the best cool gadget for you. If you want to have lunch and you can’t come to a final decision then let decision spinner help you in making one. Decision spinner is fun and at the same time, it effectively helps in making a final decision. Sometimes some people have a lot of stress in their work area and thus they need something to remove their stress at. There are many stress balls in the market but desktop punching ball is innovative and creative punching ball which can make you feel that you are in a Boxing arena. Many people are big time fans of boxing so a punching ball can help you feel energetic and stress-free. There are many people who get very easily annoyed with the clicking noise of the desktop mouse. It was a challenge for many people to come up with a desktop mouse which doesn’t make any clicking sound from the mouse. Now with the silent desktop mouse, you can easily work without any disturbance. If you have any friend who loves to make the annoying clicking sound of the mouse, then you can replace his mouse with the silent mouse. A lot of times workers get challenging task but sometimes they get tasks which are irrelevant and worthless. Now there are many people who want to just say it aloud in their head that it is totally Bull$#!^ .Now there is a button where you can press it and it will declare that it is total Bull$#!^ . It has helped a lot of people who desperately want to let out their emotions or views about their task or work. People who work in the office where they have to just sit in one place and work have shown that their health is not productive. Treadmill desk can help them walk and work at the same time. Some people doesn’t have time at all to go to the gym, even they don’t get time to do some workout at home. So treadmill desk can help them to be active and have a healthy body. A lot of people use this gadget and it is been used on most of the work areas. Digital Smart Pen can help in converting the written text into the computer and you can also record the conversation in the conference meeting room. It is very useful for the secretaries or personal assistants who have to keep an account of daily work and meeting conducted in the office. Some of the desk areas are very messy because of the cable wires entangled under the desk. Cable clips can help you arranging your cables properly. Many people get very angry and irritated with unorganized desk area thus Cable clips can help them in organizing their desk area. If your sticky note must have got over and you urgently need one then worry not, a desktop sticky note can help you in storing information virtually on the computer. It is very effective in nature as it reduces the cost of buying paper sticky notes. There is no chance of the sticky note to get lost or torn thus desktop sticky note is the coolest gadget app. Co-workers are always inquisitive and they want to know everything that you do other than work. If you want to browse some information that is not related to your work but at the same time you don’t want anyone to know what you are doing then monitor rear view mirror is the best gadget for you. It helps in getting a rear-view so that you can browse without your co-worker coming to know what you are doing. If you are bored of the old classic calendar and want to buy a calendar that can get your attention and amaze you at the same time then buy a calendar which has a lot of features. The calendar has some amazing features which have lightings and also it tells the weather forecast for the day. You will spice up your desk station with this amazing cool gadget. There are a lot of nosy co-workers who will want to see what work you are doing or wish to view your personal information, thus privacy filter can help you in keeping it safe. It will close all the information if you are not around the desk. This will maintain the security of your data and it enables privacy to your work area. A lot of stuff can be stolen without knowing who did it and it is really unfair if a very expensive stuff gets stolen. A disguised spy cam can help in making sure who entered your desk area and who stole your stuff. Disguised spy cam can come in many shape and sizes such as a vase spy cam, Squirrel spy cam and much more. If you have a lot of things in the mind and your key constantly gets misplaced then wireless key finder is the perfect gadget for you. A wireless key finder is linked with your desktop or mobile, you can press the button to know the geo location of your key or the wireless key finder will automatically make noise that helps you in finding your key. A desktop organizer helps you in organizing all the stationary items and phones. In a desktop organizer, you can get a cup holder, a pencil holder, a sticky note compartment, keeping pictures, phone holder and much more. A desktop organizer helps in making your workstation look neat and in organized manner. Many people will appreciate even your boss will respect you for keeping the workspace productive and organized. Platform desktop can help you if you like to work standing sometimes. It helps you in restructuring your desktop to go up or come to a level. It is very effective and productive for people who want to work standing up or people who have treadmill desk. This can help them to level their desktop according to their comfort ability. Head desk lamp is essential for people who have inadequate lighting in the work area. It gives a natural light thus it won’t give much stress to the eyes. Head Desk lamp has 4 different modes for reading. The brightness of the head desk lamp can also be adjusted according to your comfort level. There are offices which don’t have many windows so such offices are very compact and compressed. People working in such office conditions suffer from a lot of work stress. Nature proves to be the best stress reliever thus Sky Light covers gives a feeling that you are looking at the sky and trees. It helps you get energized and make you more productive. If you have a limited USB panel and you need to put 2 to 3 USB drive at the same time then flower USB panel can help you in doing that. When you put the USB drive the stem of the flower automatically get lit up. It is very portable in nature and very productive that can help in finishing your work faster. Multiple USB panels is easily available on any online shopping platform. People love taking their frustration out on a punching bag and something similar can be done even for the everyday desk jobbers. People aren’t always in a happy mood and get angry at times in the workplace. The frustration can be easily taken out on this small punching bag. It has a suction cup at its rear end which can be easily attached to any desktop table surface and people can punch their stress away to keep them calm. These transparent writable coaster pads can help in solving two common problems in the workplace i.e. keeping the desk free from coffee stains and writing important notes for that moment which can be erased later. An Apple Fan would love to have this product along with their other Apple appliances. This is an induction charger which charges up to three different Apple devices at a single time and comes with an additional 4 USB charger slots. If a person’s work life involves a lot of paperwork then this handy shredder would be put to good use. The person can manually and easily shred their papers which they wish to dispose-off. A pen holder is a common thing present on every individual’s desk but an innovative pen holder would bring a different atmosphere to the person. This rectangular shaped Apple Macintosh Pen holder would be perfect for the person to keep their pens, pencils and other stationary items right up to a small plant. Assigning the proper labels for the right items brings a smooth workflow. So, why don’t we keep the unnecessary papers lying around the desk in a box and label them as ‘crap.’ Such handmade boxes come in handy to eliminate any of the unnecessary stuff lying around. Make the workplace interesting by adding an emoticon calendar to describe how that particular day in the office went by. The person can begin by simply drawing small blank circles and drawing an emoticon on one circle every day to describe how that particular day went by. A blue circle can indicate the starting day of that particular month. And as every single day goes by, every emoticon can indicate the pattern whether it is happy or sad. The work environment can be a stressful environment and we all know that. So, we need to find certain ways or in this case, find gadgets which can reduce stress and laziness and increase efficiency and productivity. It is time to start acting smarter so that we can enjoy working at any kind of job and make it more and more interesting as every single day goes by. Previous articleHow to Attract Freelancers with an Irresistible Job offer?